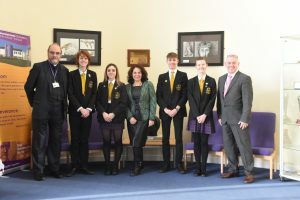 On Friday 1st February, members of the school councils from all years me MP Julie Elliot to talk about her career and ask any questions they may have about a career in Parliament or aspects of her job. Julie Elliot has been a Member of Parliament since 2010 and in her speech to our council members she spoke about her education at Newcastle Polytechnic (which is now known as Northumbria University) where she graduated from at the age of 26 with a degree in Government and Public Policy. When it came to asking questions about Julie Elliot’s job our students were very inquisitive. She likes doing community work and helping out, especially locally. However, she isn’t keen on travelling but going from the North East to London is an essential part of her job and so the travel is compulsory.